You can also have a look at the whole 1919 or at July 19 across the years. Have a look at the old newspapers from 19 July 1919 and get them! Get a FREE Numerology report based on the digits of 19 July 1919! Which were the important events of 19 July 1919 ? Robert Pinget: Novelist / Playwright, dies at 78. Dallas McKennon: American actor (d. 2009). Patricia Medina: Liverpool, England -- Actress (High-Low). Solange Troisier: French physician, Inspector General of Prisons, and deputy for the Val-d'Oise. Ron Searle: English-Canadian soldier publisher and politician 4th Mayor of Mississauga (d. 2015). Miltos Sachtouris: Greek poet and author (d. 2005). Richard Ellis: Laurel Military man. Following Peace Day celebrations marking the end of World War I, ex-servicemen riot and burn down Luton Town Hall. ...and if 19 July 1919 was your Birth Date then Join our Birthday Club! 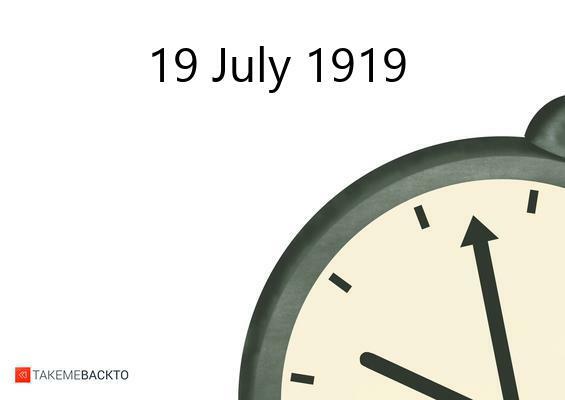 Tell the world why 19 July 1919 is such a special date for you!